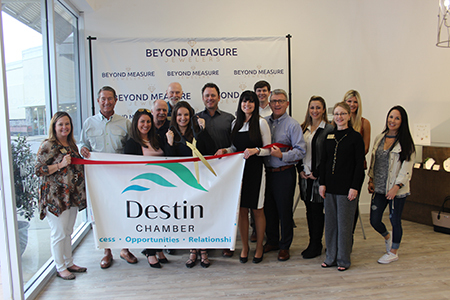 Destin, Fla., Feb. 7 – On Feb. 6, Beyond Measure Jewelers celebrated a ribbon cutting with the Destin Chamber. Beyond Measure Jewelers is your fine jewelry and engagement ring specialists, also offering jewelry repair, watch repair and custom designs. Visit the showroom at 4489 Commons Dr. W. 4C, in Destin. For more information, please call (850) 424-7011 or visit shopbeyondmeasure.com.